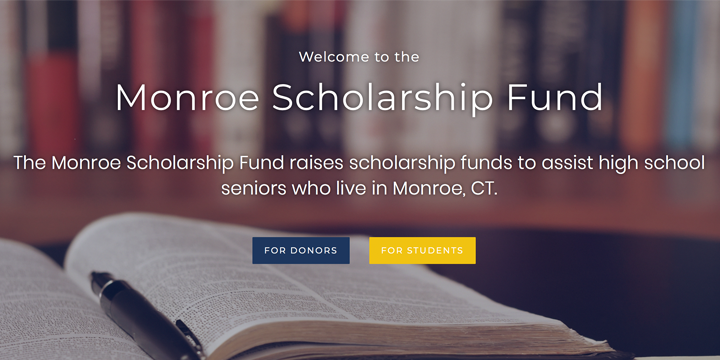 After 60 years of successfully connecting Monroe, CT high school seniors with funds to help with college expenses, the Monroe Scholarship Fund, Inc. is excited to announce their new look. Over the last few months, the Board of Directors worked with a local designer to create a logo and website, giving the organization a new look and an updated web presence. You may be thinking–why not red and black? The Town of Monroe does not have official town colors. Red and black are Masuk High School's colors, but the Monroe Scholarship Fund supports any high school senior living in Monroe, CT. The new logo has two very specific colors–blue and gold. Blue represents the confidence and trust that the donors place in the organization to match their contributions with deserving students. Gold represents the academic excellence of the eligible students that can apply for scholarships. The design features a new tagline, "Supporting Monroe scholars since 1958," emphasizing the organization's long history and purpose. The tassel, a symbol of a graduate, is accented in gold to symbolize the applicants' academic achievement. Now, potential donors, students, and supporters can learn about the Monroe Scholarship Fund in the comfort of their own home. All information about the organization can be found on the website. However, one of the most exciting changes directly affects the donors. The Monroe Scholarship Fund can now accept donations online. And if the more traditional method is preferred, all the forms are available for download from the website as well. Established in 1958, the Monroe Scholarship Fund, Inc. is a non-profit 501c(3) organization. Our purpose is to raise scholarship funds to assist high school seniors who live in Monroe, CT. Our goal is to increase both the level of financial assistance and the number of scholarships available to deserving high school seniors.